Two of the five suspects arrested in connection with Berta Caceres’ murder are linked to DESA, the company behind the dam project she fought to stop. 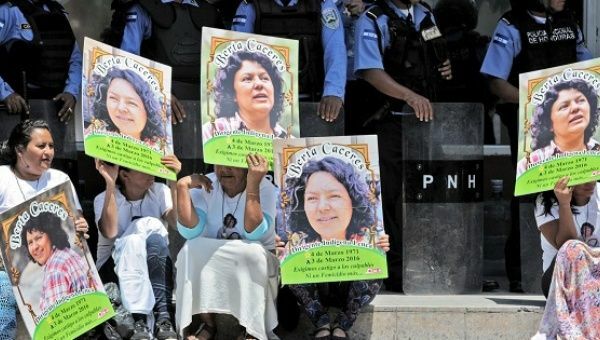 Washington’s complicity in human rights abuses and repression of social movements in Honduras has come to the fore once again as an investigation published in Counterpunch revealed that the private Honduran energy company that murdered Indigenous activist Berta Caceres long resisted has signed a funding deal with a USAID partner just months before her high-profile assassination. The company behind the controversial Agua Zarca hydroelectric project on Lenca land, Desarrollos Energeticos S.A., better known as DESA, signed a contract with USAID partner Fintrac in December 2015, less than three months before Caceres wasmurdered in her home on March 3. According to Central America-based freelance journalist Gloria Jimenez, the funds were destined for a USAID agricultural assistance program in Western Honduras. But Caceres’ Civic Council of Popular and Indigenous Movements of Honduras, or COPINH, which has long fought against DESA’s Agua Zarca dam for its threats to the sacred Gualcarque River and lack of consent from local communities, has argued that despite the corporation’s promises, DESA takes much more than it gives back. The Fintrac-DESA agreement was signed by Sergio Rodriguez, a DESA employee and suspect arrested in connection with Caceres’ murder along with four others. In a statement released after the arrests, DESA confirmed that Rodriguez worked for the company as the manager of its social and environmental issues division. DESA did not confirm any relation to suspect Douglas Bustillo, who elsewhere has been identified as the firm’s head of security. In a recent email to teleSUR, DESA declined an interview, saying it cannot comment on cases under investigation in Honduran courts. “Additionally, our company operates completely in line with the law and the strictest business values,” the email added. Caceres’ family members have claimed that DESA and the Honduran government are ultimately responsible for the Indigenous leader’s murder. In the months leading up to her murder, Caceres denounced dozens of death threats, incidents of harassment, and threats of sexual violence, allegedly at the hands of state and private agents. Over two years ago, DESA sought charges against Caceres and two fellow COPINH leaders for land usurpation, coercion, and damages and painted the activists as violent “anarchists.” COPINH members and human rights defenders interpret the case as one part of a larger campaign by DESA to criminalize COPINH and eliminate opposition to the Agua Zarca project. COPINH and Caceres’ family members continue to call for an independent expert investigation into the murder in the name of identifying those who ordered the killing, not just those who pulled the trigger. They also demand the permanent cancellation of Agua Zarca. An international day of action on June 15 at Honduran embassies around the world is planned to echo COPINH’s demands at the global level. International human rights defenders have repeatedly called on the United States to stop funding repression in Honduras through backing of controversial corporate projects and government funding for corrupt Honduran security forces.